Pollard said a Sangoma she consulted about the etiquette of using a European system to tell African tales told her that Tarot was “the bones” of her ancestors and that “the voices of Africa are in your heart – you should tell the stories”. She said while Tarot decks traditionally relied on images belonging to the European Renaissance period dating back 600 hundred, their equivalents can be found in African mythology. 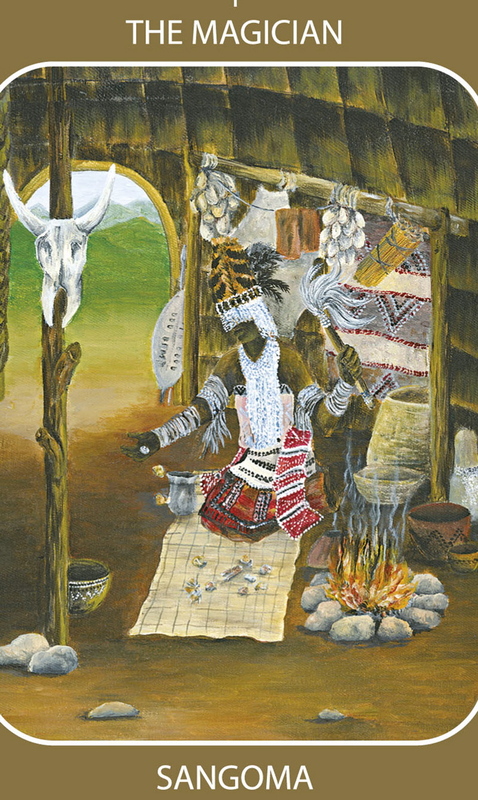 She said iTongo transposed the symbolism and meaning of the European-based decks to visual images that are uniquely South African yet retain the universality of the Tarot archetypes. She said her aim was to present broad patterns of what is known of the mythology and history of South Africa preceding the arrival of Dutch and British settlers. As such, it was based on African folk tales that were passed down by the tribal story tellers in an oral tradition from one generation to the next. Hence she said she chose tales that resonated with the themes and archetypes of Tarot rather than specific icons or periods in South African history as she sought to reflect in some way the diversity of the South African nation. She said it was accessible to anyone who is interested in self discovery, South African stories or in Tarot. The cards also got the thumbs up from award winning author Rachel Pollack. Like most accounts of tarot in English language media, this story is a little misleading. Tarot cards have not always been associated with the occult or fortune telling. The tarot was really made for card games still played in countries like France. It is a gross distortion of culture to have people believe that tarot cards are only used for tarot reading. This perfectly good article does not say anywhere that Tarot was only ever used for one thing historically and it is not an academic thesis on Tarot anyway but a Tarot deck review. Howdy very cool website!! Guy .. Beautiful .. Wonderful .. I’ll bookmark your blog and take the feeds additionally?I am satisfied to find a lot of helpful information here within the post, we’d like develop extra strategies in this regard, thanks for sharing. . . . . .